The American DJ Mega Flat Pak Plus is a convenient solution for the mobile entertainer to provide Pure Lighting Excitement at any party. 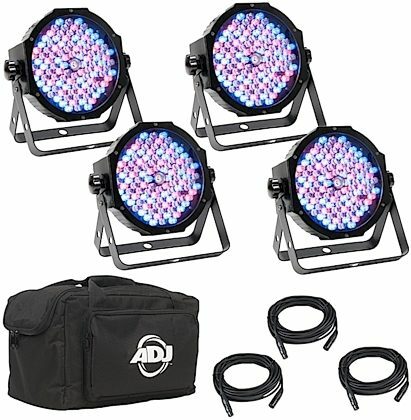 It includes four (4) of the popular ADJ Mega Par Profile Plus LED Wash Fixtures, three (3) DMX connector cables, and a soft carrying case to protect your Mega Par Profile Plus's during transport and dust-free while storing. The Mega Par Profile Plus slim design and vibrant RGB + UV output is perfect for Uplighting, stage washing and wall washing. The carrying case easily fits four Mega Par Profile Plus's and the DMX cables, plus a space for a small LED Controller (controller not included). Overall: Coupled with the Obey 40 these lights are great! Bright enough to cover a good size stage with just 4 of them... The UV light is not as bright as the rest but will still shine a smaller stage say 12x12 or so. Fast response, lite enough to be able to mount other lights on our light bar. Only thing I wish is that zZounds would process payments faster!!! It takes forever for them to process a 4 pay payment!